Incorporating the strong flavours of onions, ginger and garlic, this classic Indian staple is delicious on its own, with lot of lovely naan bread to pick it up, or as a complement to other Indian dishes. 1. Soak the chana daal in cold water for 15-20 minutes, then rinse it in cold water to wash the starch out. 2. 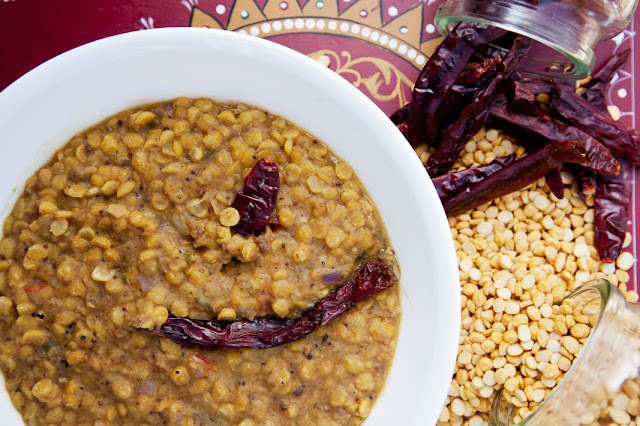 Bring 500ml water to the boil and cook the chana daal in a large pan, with a large pinch of salt and the turmeric powder. Reduce the heat and simmer for about 30 minutes until soft. 3. Heat the oil in a pan and add the mustard seeds. When they start to pop, add the chopped onions and soften on a low heat. Don't let them brown. 5. Add the crushed cumin and coriander seeds to the onion paste, then stir through the chopped tomato and cook for another 2-3 minutes. Keep stirring so that the paste doesn't burn. Add a few drops of hot water if it begins to stick, and stir the garam masala through. 6. Add the cooked chana daal and mix well with the onion paste. Cover the pan and cook on a very low heat for 2-3 minutes. 7. Serve with curry dishes or on its own with plenty of naan bread.